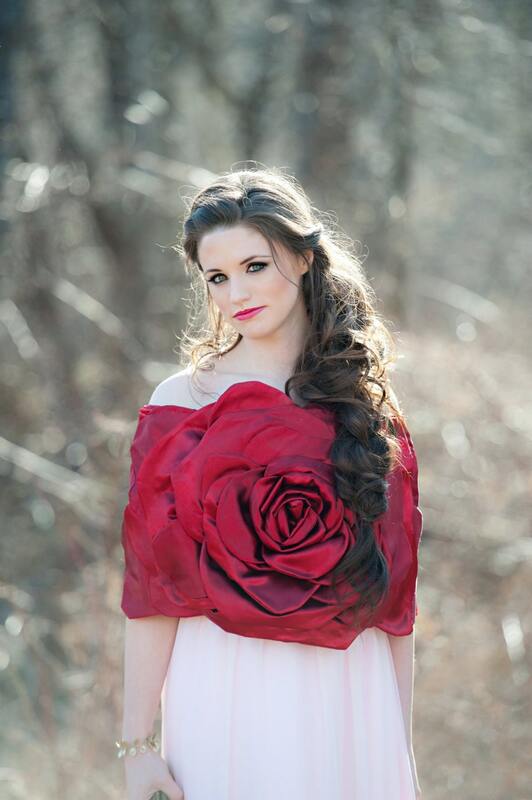 This Sweetheart Rose Shoulder Wrap Shrug is hand-crafted with a lot of time and care. The petals are carefully sewn together and each petal is placed and pined in an orientation that would echo the botanical design of a rose. The shrug is lined with a sleek polyester lining, and beneath that it is lined with a warm fleece. This shrug is perfect for a bride, or to be worn at a fancy event. The shrug could be worn in all seasons, but it was designed with the cooler seasons in mind. The Sweetheart Rose Shoulder Wrap Shrug is one of my original designs. It is lovely, and romantic, yet different and fantastical. It is perfect for someone who likes something a bit bolder and likes to express themselves through what they wear. I can create this same design in another colour, (perhaps white) or slightly varied in size or shape, to fit your needs. This Shoulder wrap shrug is made to order, It will need to be ordered/ purchased a minimum of 8 weeks prior to the date you will be wearing it. To make this piece for you, the two measurements I need are listed below. If you want to buy this, contact me with and I can let you know how to take these measurements correctly.If you have any questions, send me a message. The necklace came much earlier than expected (took only about 10 days to Japan). It was packaged with so much care, nothing was broken during the long journey, and was in a beautiful box. The necklace itself is so springlike, beautiful, and gorgeous, and , I couldn't wait to wear it on some special occasion. Thank you! I love these beautiful hand-crafted bracelets! absolutely love my beautiful necklace! thank you so much!!! I accept payments made through PayPal and Credit Cards. If you do not have PayPal you can still make a payment through PayPal with your credit card. Items will be sent once the payment has cleared. For jewellery, if the item breaks at some point in its lifespan, I am happy to fix it free of charge as long as all the original components are there. If you do not have all the pieces, contact me and we can figure out if the missing pieces are something I can replace or not, and how much it would cost to replace them. However, I will not be responsible for shipping costs of broken items, so contact me for a quote on the shipping cost of your item. Shipping costs vary from from item, please look at the bottom of the descriptions for details. I cannot be held responsible for items getting lost in the mail. If you would like some security you can purchase insurance, you can let me know and I will alter the shipping cost for you. For what its worth, I order online all the time and have not had a problem yet with a item getting lost in the mail. I will be making trips to the post office twice a week, so your order will be shipped out one to two days after your payment clears. I can create custom orders, just contact me and we can work something out!